have many handcuffs to choose from. 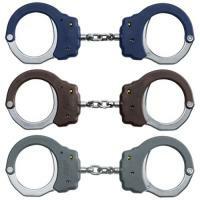 Lightweight stainless steel handcuffs - weigh less than 9 oz. Lite weight and easier to use. Very slow ratchet. You actually have to close the cuff, big disadvantage However, great material, and light weight. A keyway on both sides of each cuff. Surprised no one thought of that years ago. Very nice and quick to use in a pinch. I would recommend these to all professionals. I love these cuffs. They are the only one's I use now. The ease of use and the durability of the polymer coating. I love the fact there is a double keyway. How many times have you changed custody of a prisoner just to have the other guy place his cuffs over yours blocking the keyway? With these that no longer matters and you can put them on each a different way and it does not matter. In the heat of a scuffle you will no longer have to worry about proper cuff orientation. Exactly what I was looking for. Previous handcuffs were also the same model. Work as well as all metal cuffs. Light weight. Would They Fit A Bianchi Handcuff Case? You will need cases that are specifically for ASP cuffs as they are slightly larger. Please look at the "ASP Duty Handcuff Case for Chain or Hinged Cuffs". Do they fit in regular handcuff pouches? No, they are slightly larger. You will need pouches made for the ASP handcuffs. What is the wrist opening size? The minimum opening set for standard handcuffs is 2 inches. This is enough to insert one wrist on each cuff. Meanwhile, the minimum inner perimeter is set at 7.9 inches. In this position, the ratchet is clipped at the first notch, right before it enters through the lock. On the other hand, the maximum inner perimeter is 6.5 inches.